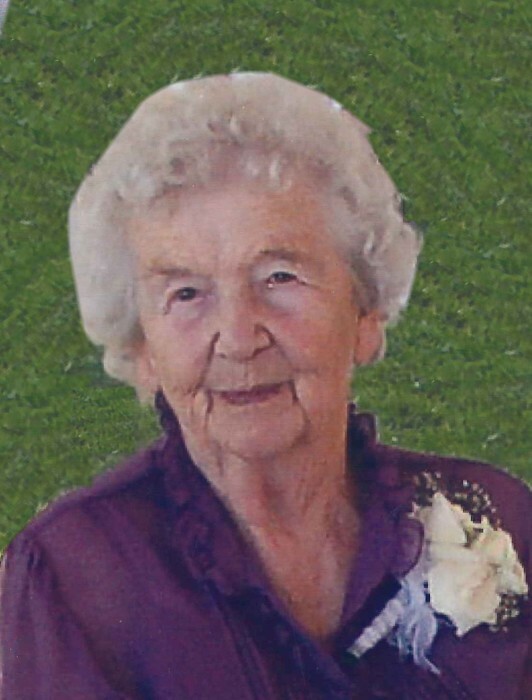 Kathryn Luella (Tangan) Arthun, age 103, of Wilsall, currently residing in Bozeman passed away on Tuesday, August 28, 2018 at the Gallatin Rest Home. A funeral service will be held at 10:00 A.M. on Saturday, September 1st, hosted at American Lutheran Church, 129 South F Street, Livingston with Pastor Paul Seastrand officiating. Viewing will be held an hour prior at the church. The service will be followed by a graveside service and burial at the Wilsall Cemetery. A reception will then be held at the Wilsall Senior Center. Kathryn was born August 13, 1915 near Ringling, Montana at the homestead ranch of her parents – John and Matilda Tangan. Kathryn first attended country school at the Billy Creek School. Then Kathryn’s high school years and some grade school years were spent in Ringling where she graduated from high school in May of 1934. The family would rent a house where they stayed in town for months at a time while the children attended school. In June 1934, after she graduated from high school, Kathryn went to what was then called “Normal School” in Dillon, Montana. Kathryn traveled back and forth by rail, which was a popular mode of transportation at that time. Being Kathryn has lived over a century she had experienced several modes of transportation: from the horse and buggy, hay wagon or whatever farm implement required horses, to the family’s first car, purchased when she was about 5 years old, to the train. Then while attending school in Dillon she had her first airplane ride – it was her first and last in a small plane. She would later over come her fear and flew commercial passenger flights to Hawaii, San Diego and Phoenix. She began her first year of teaching at the Baird School, a one room country school near Wibaux. There were 8 children who were eager students in grades 1 through 8. She has good memories of those students, but was happy to find, after 1 year in extreme eastern Montana, there was a teaching position closer to her childhood home. In 1935 she began teaching at the Lennup school in Meagher County. The next four years she taught there, living at the teacherage for awhile and then with the Engen family. Two of the Engen children were also in her classroom. Later she would become the mother -in-law of the Engen children’s niece – Chris (Hogg) Arthun. In 1939-40 she taught at the TipTop School near Ringling, and in 1940 came to Wilsall to teach grades four and five. For the last of her 35-year teaching career in Wilsall, she taught first and second grade. She has many wonderful memories of the children, the parents, various administrative people and fellow teachers through her many years at Wilsall School. Kathryn and Carl Arthun were married May 1, 1942. She taught, and he worked ranches and carpentry, living at several locations until they were able to purchase their first place, which is the location of the original family ranch. In 1945 Kathryn discontinued teaching for eight years at which time their daughter, Carol, was born. Kathryn helped Carl, in all the struggles associated with operating a ranch involving cattle, sheep, chickens, pigs, horses, milk cows, and occasionally cooking for ranch hands. She worried through snowstorms when Carl would have to go out to feed cattle in spite of blizzard conditions, and hot summer days when drought and hailstorms would threaten to take the crops. In spite of these problems year after year and health problems that would plague Carl, they both persevered and would not give up, doing the best they could. In 1953 Carl became seriously ill with rheumatic fever and rheumatoid arthritis. Kathryn had to care for him in and out of the hospital and went back to teaching to help pay the bills. As Carl slowly regained his health she was able to continue teaching from 1953 to 1978. Kathryn and Carl have been members of Shields River Lutheran Church during their lifetime in this valley. The Church Bazaar was usually the scene of a spirited bidding for one of her crocheted afghans. And lutefisk supper was not complete without her “white sauce”. Besides keeping track of her children and grandchildren, Kathryn enjoyed keeping her house, gardening, crocheting, reading and spending time with family and friends. Kathryn is survived by her: Daughter, Carol (Greg) Murray of Bozeman their son, Dr. Bret (Terese) Murray, their son, Everett; their daughter, Kyla (Mike) Murray-Robitaille and their son, Ben and daughter, Morgan; Son, Les (Chris) Arthun of Wilsall and their son, Leif (Lacey) Arthun, their son, Tryg; their daughter, Courtney (Marc) Robitaille; and son, Brock (Kelsi) Arthun, and their sons, Graydin, Mason and Daxton; Son, Kevin Arthun of Bozeman. As well as, many nieces, nephews, cousins and friends. Kathryn was preceded in death by her husband Carl in 2000, her parents John and Matilda Tangan, siblings, Delores and John Jr.
Memorial donations may be made to REACH, Inc. 322 Gallatin Park Drive Bozeman, MT 59715, or the donor’s choice. We thank the Gallatin Rest Home for their dedicated and concerned care of our dear mother.